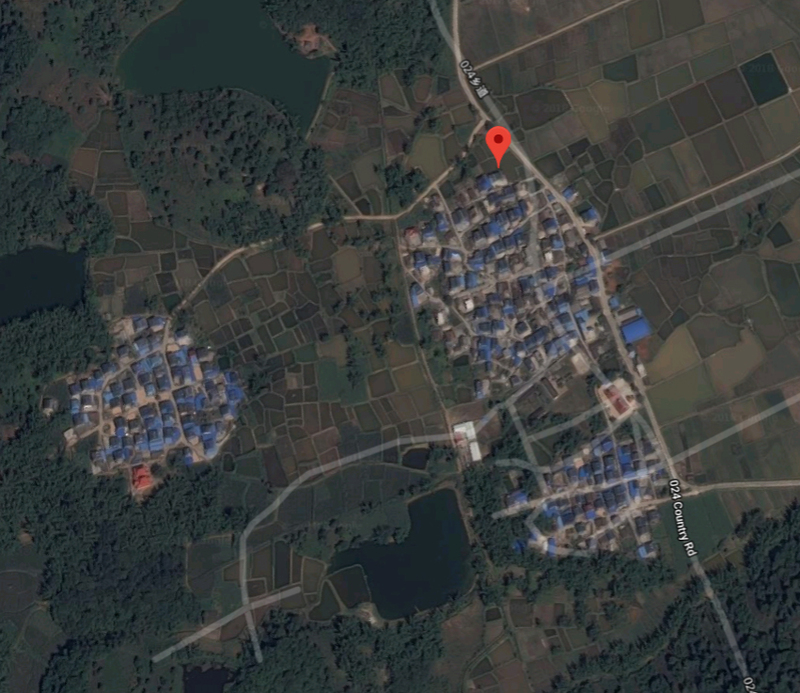 Exact fall location of first meteorite found in Manlun. 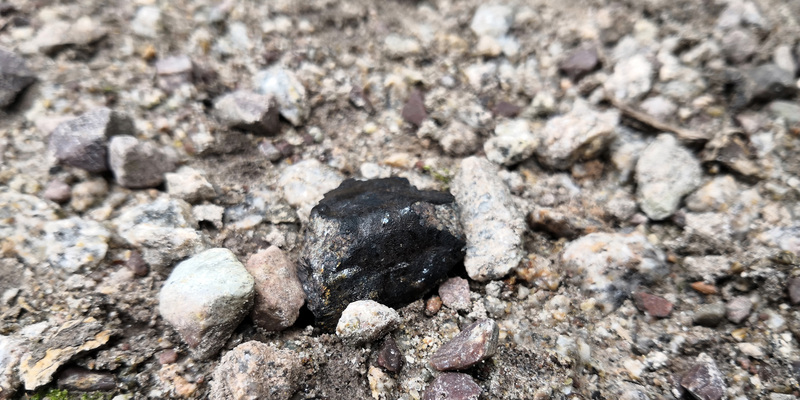 A meteorite, an ordinary chondrite (L6 / 84 g), was found by a local villager in the early morning of 2 June 2018. 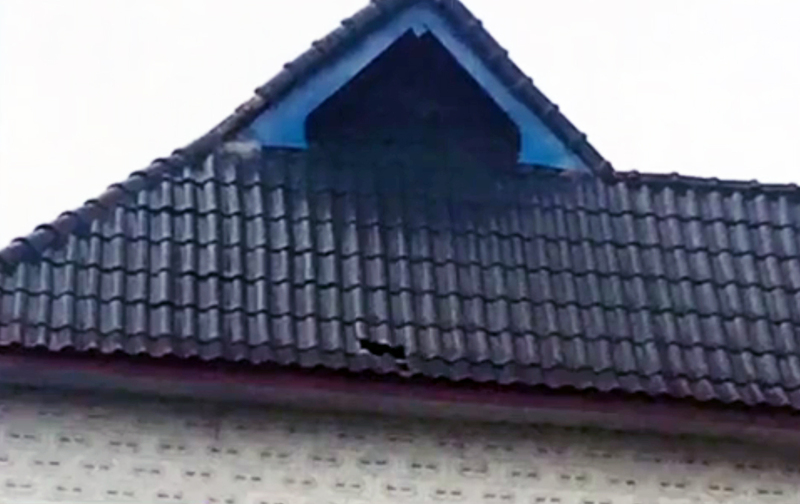 The meteorite hit a roof tile of his house in the village of Manlun (Mànlún/曼伦) in Menghai County (勐海县) and left a hole in the roof. In the evening of 1 June while watching TV the owner Mr. Yán Xiāng (岩香) heard a sound (呜呜), similar to the sound of an airplane, and then a loud noise. Since it was Children’s Day he thought some child had thrown a rock on his roof. 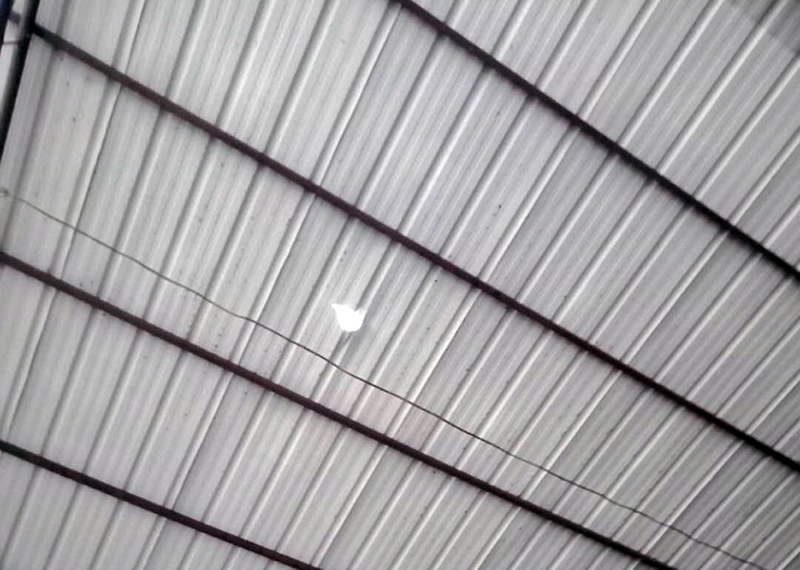 The following morning at around 9 am he saw the hole in the roof and found the meteorite on the second floor of the house, next to the broken roof tile. His daughter told him about the continuing coverage of the large bolide above Jinghong in a social media network. 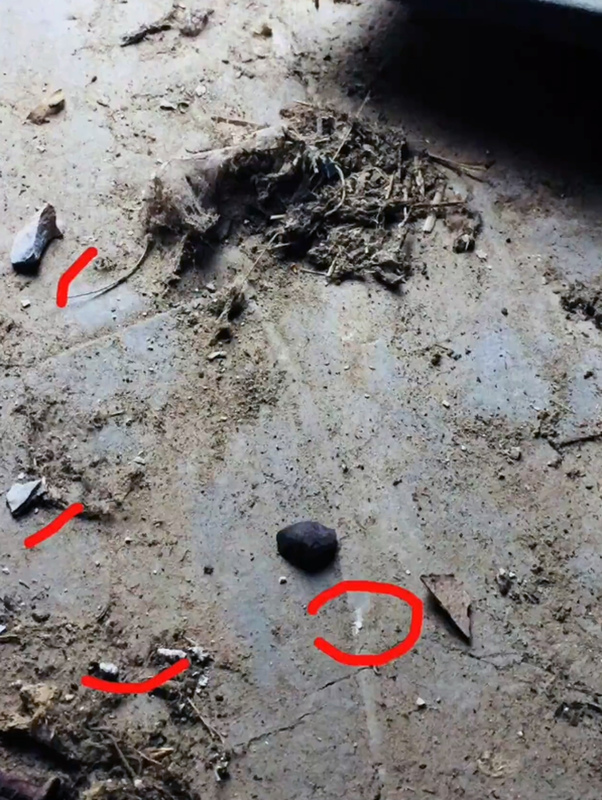 Yán wanted to know if the stone he had found was in fact a meteorite and sent a video and two photos of the meteorite to Jiang Wei (蒋维) on 2 June. The exact location of the fall has not been published so far, but the most likely fall location would be this one: 22.001284, 100.196186. Yán and his wife Yùhǎn (玉罕) initially were reluctant to sell their meteorite because they considered it ‘a gift from the heavens’. With the help of three to four guards sent by the local village committee who in turns protected the meteorite the family exhibited their meteorite, covered by a protective glass case, to the public in the garage next to their home for a few days from 7 a.m. in the morning. Many people came to ‘worship’ the meteorite. Eventually on 8 June the family was offered a high amount of money for the broken roof tile and the 84-g-meteorite. This made the family sell the meteorite to an anonymous buyer. 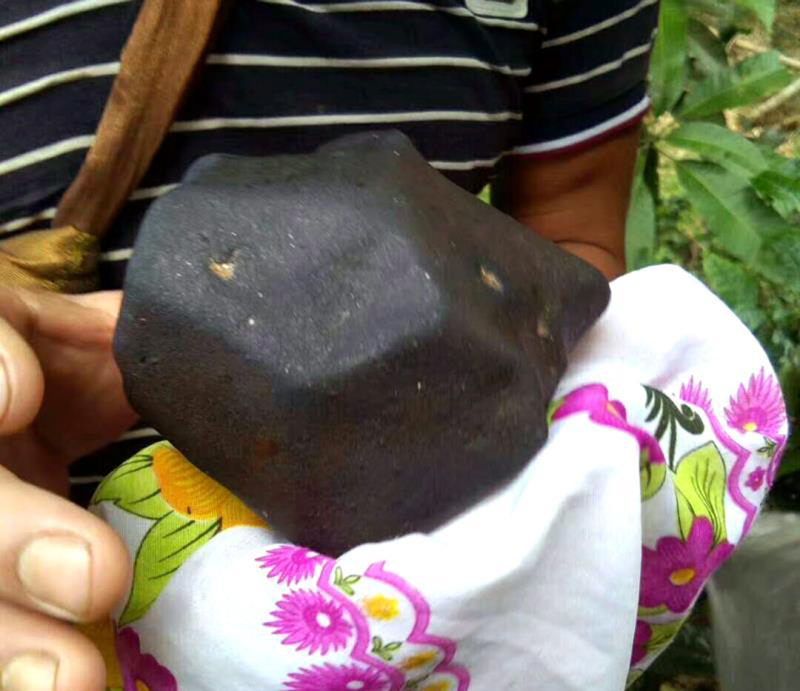 In the morning of 2 June a second meteorite (~ 150 g) was found in Manlun, Menghai County. 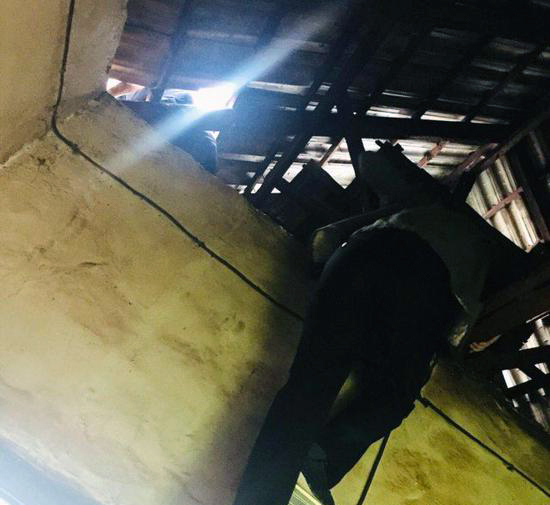 It fell into the cowshed of mister Yán Guāng (岩光), the director of Manlun’s village committee, who found it after he had been told by his family that the cowshed had been struck by lightning. The meteorite crashed through a thin blue roof, hit the concrete floor, fragmented into five pieces and left a shallow fist-sized impact pit at location 21°59’55″N 100°11’30″E. Yán Guāng (岩光) kept the meteorite fragments. In the morning of 3 June Jiang Wei (蒋维) and Zhang Baolin (张宝林) arrived at the fall location to investigate the finds of which six were meteorites. In the afternoon another 20 specimens could be found. 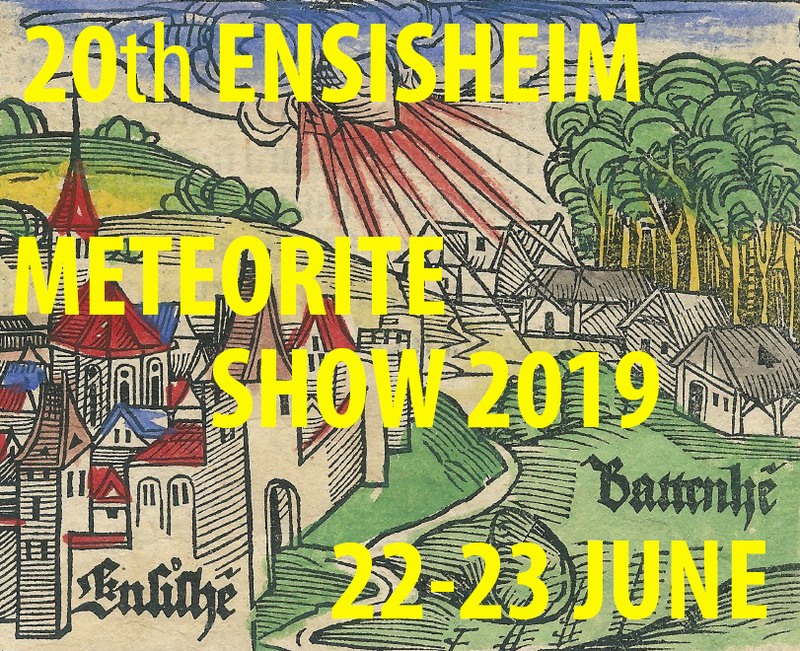 On 4 June it was reported that in the meantime between 100 and 200 meteorites, many small ones (2-5 cm), had been found by the villagers of the area. The largest meteorite weighs 1228 grams. Different sources claim there are some larger specimens weighing between 500 and 600 grams. 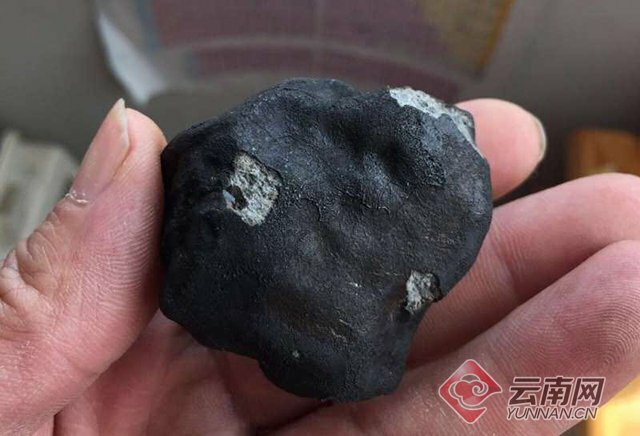 Many meteorites have been sold to national and international dealers or collectors who had traveled to the area from Guangdong, Beijing, Shanghai, Kunming and others from 2 June. 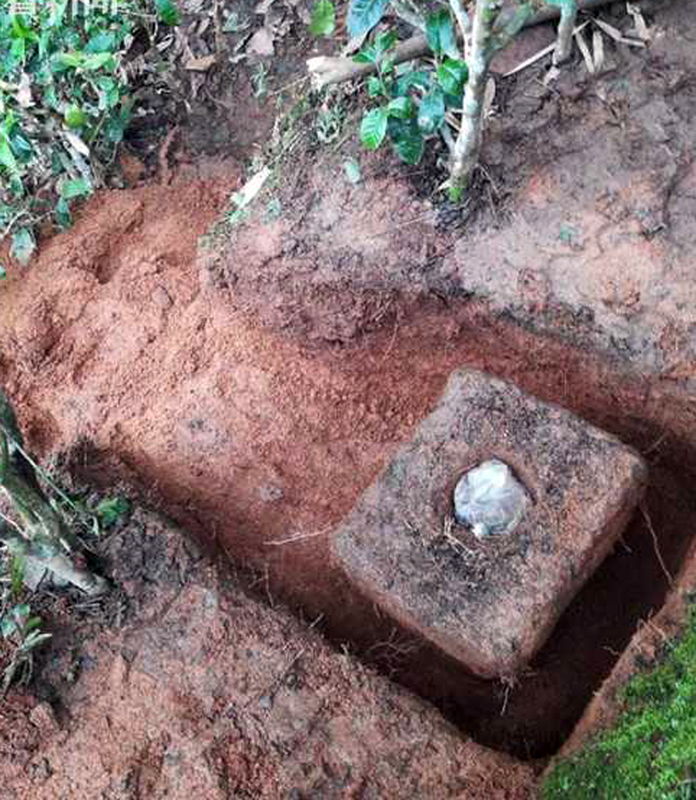 At least 600 locals were searching for meteorites in the rice and sugarcane fields of the area. 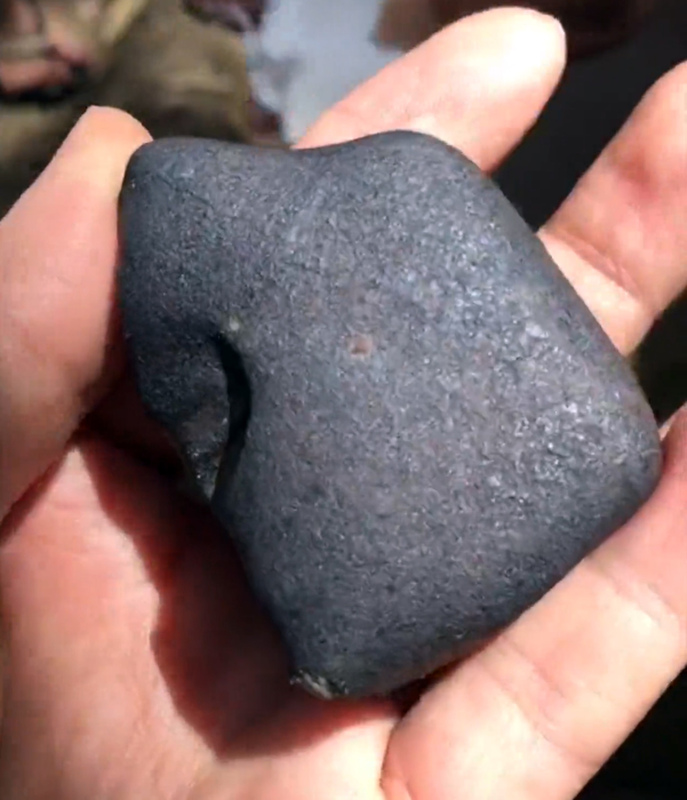 All in all an estimated number of 3000 people were actively searching for meteorites in the area. The soil is soft and muddy after intense rainfalls hit the area from 2 June and continued on 5 June. On 4 June Mr. Jiang Wei (蒋维) sent some meteorite fragments he had bought from a local villager on 3 June to the Institute of Geology and Geophysics, Chinese Academy of Sciences (IGGCAS) in Beijing for analysis, classification and registration as witnessed fall in the Meteoritical Bulletin Database. 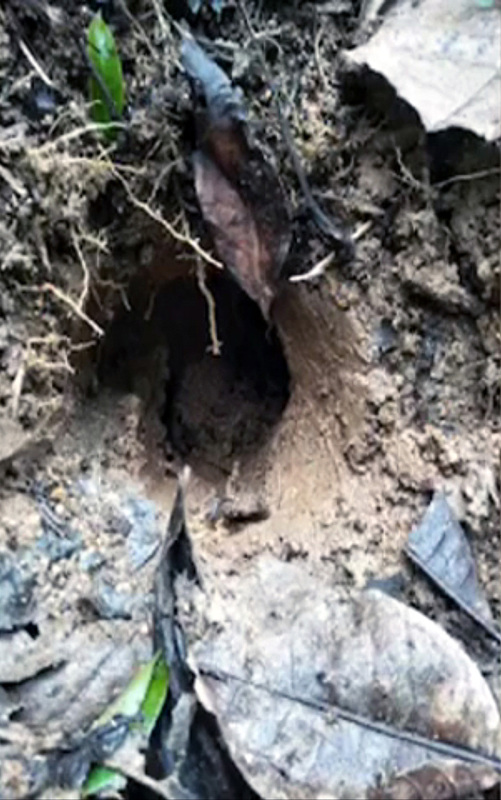 On 5 June Mr. Yan (岩), a villager from Mànlǎng (曼朗) found a 717-g-specimen, the second largest known specimen of the fall, in a shallow impact pit in a tea garden. On 8 June it was reported that a 1228-gram-specimen had been found about 4.35 km from Manlun the day before. 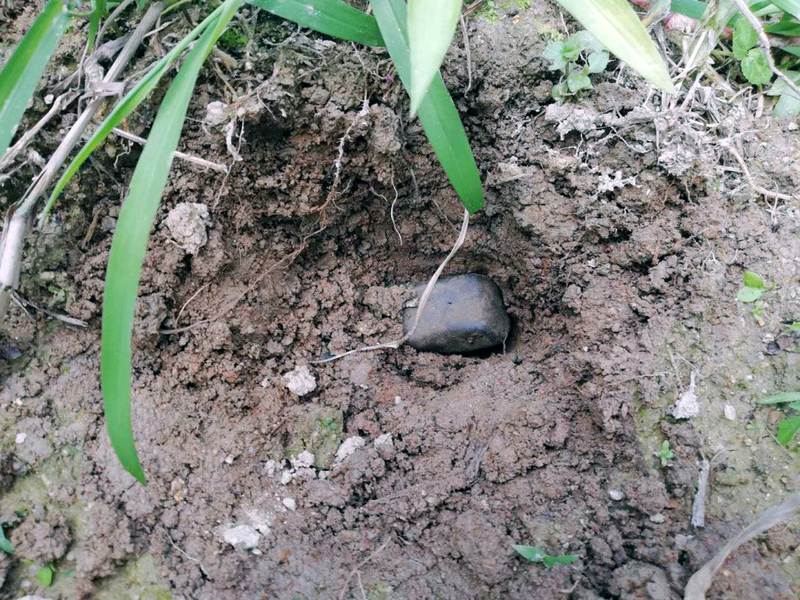 The meteorite was accidentally found by Ms. Yu Xianghuai (玉香怀) while picking tea in the tea garden of Yan Wenxiang’s (岩温香对) family at location 22°02’6″N 100°10’29″E near the village of Màngui (曼桂). 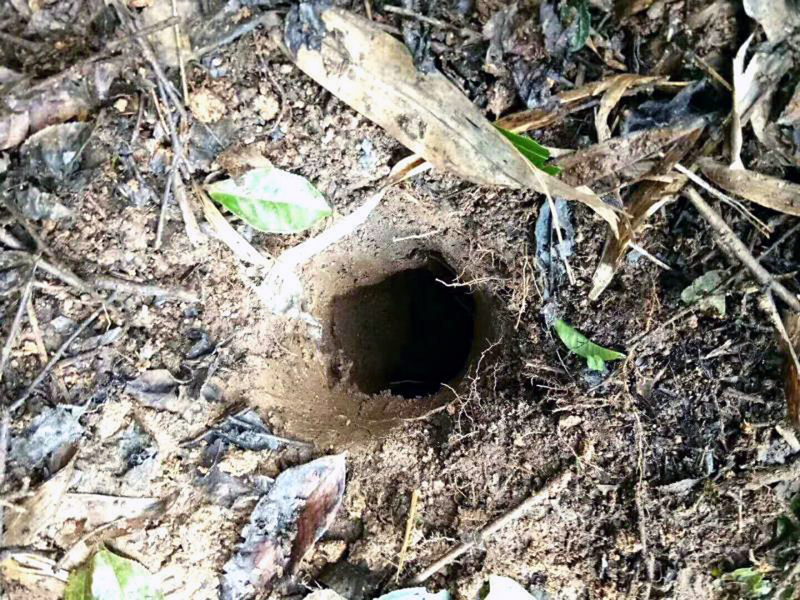 When she found the hole in the ground on a flat path next to a row of tea bushes on a steep hillside on 7 June Ms. Yu Xianghuai (玉香怀) knew she had not seen it there before, which made her become curious. She lowered her crutch into the hole, hit something hard and heard a sound that could not come from some earth being hit. She went away to tell her family. 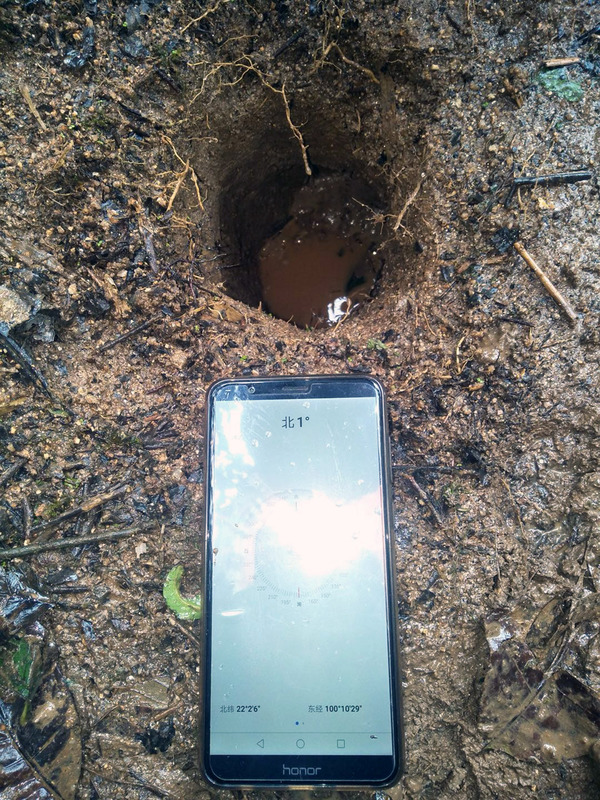 The impact hole Ms. Yu Xianghuai (玉香怀) found had a diameter of 13 cm and a depth of 25 cm. The meteorite seems to have hit the ground at an angle of ~ 70 degrees. 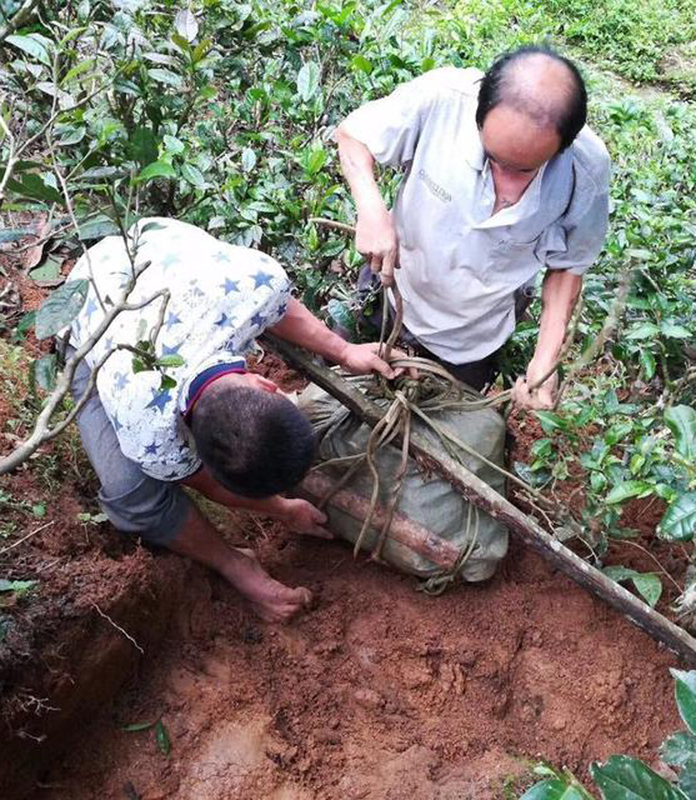 At about 2.20 p.m. Yan Wenxiang (岩温香对) took the meteorite out of the muddy impact hole. The intact ground around the impact hole including the hole itself was recovered between 13-16 August after negotiations between Zhang Bo (张勃) and Ms. Yu Xianghuai (玉香怀) who had decided to donate it to the Shanghai Science and Technology Museum where it arrived on 18 August to be exhibited at a press conference of the Shanghai Science and Technology Museum in the early afternoon of 25 August 2018. 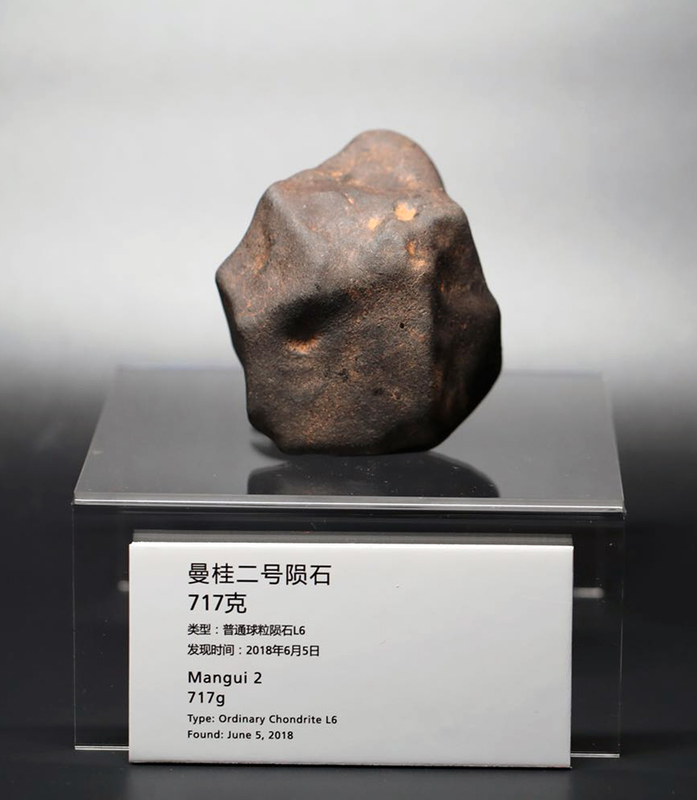 Both Mangui 1 (1228 g) and Mangui 2 (717g) have been bought by Zhang Bo (张勃) and will be loaned to the new Shanghai Planetarium to be exhibited there from 2020. 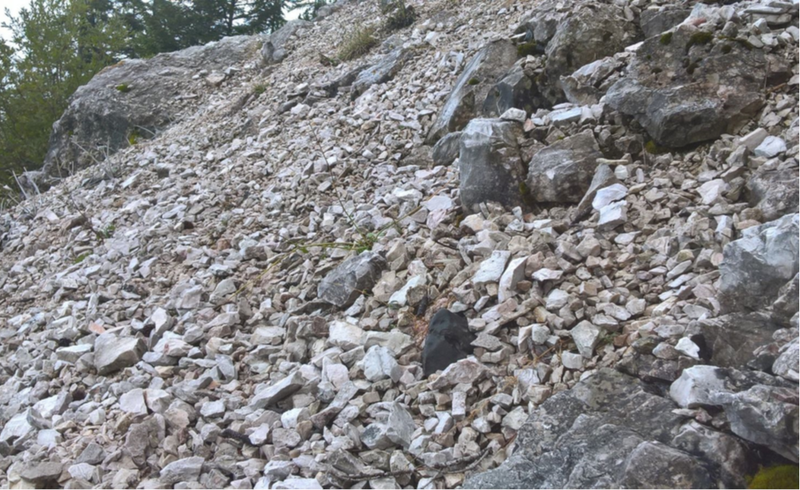 On 9 June it was reported that a 640-gram-specimen had been found in a wood near a village (22°1’4″, 100°11’41”) 1.84 km north of the fall location of the first find in Manlun. It apparently hit a larger rock on impact. 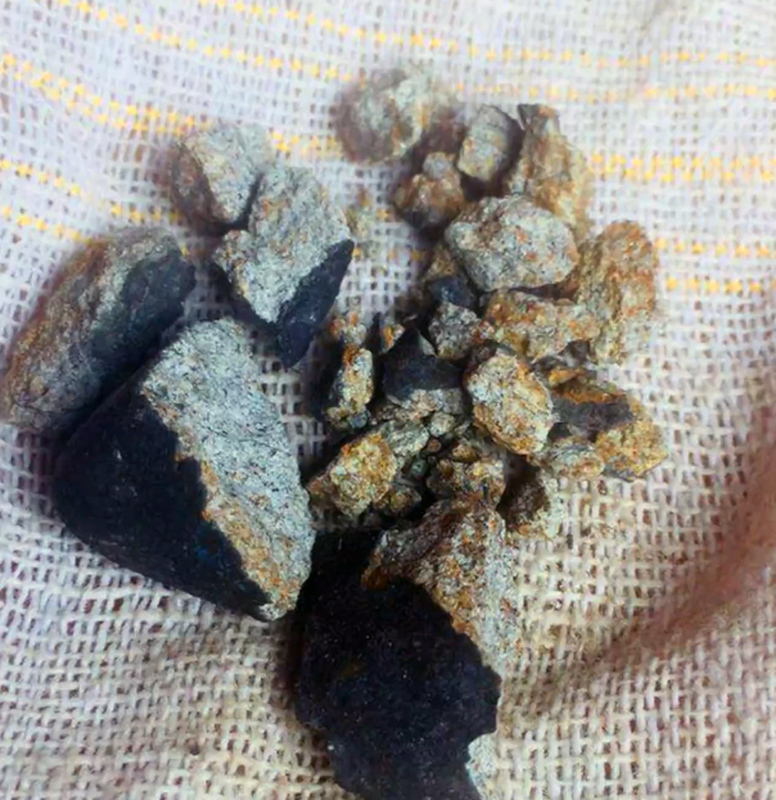 Other meteorites were found in the villages Mànyàn (曼燕), Mànzhuāng (曼庄), and Mànhǎilóng (曼海龙). 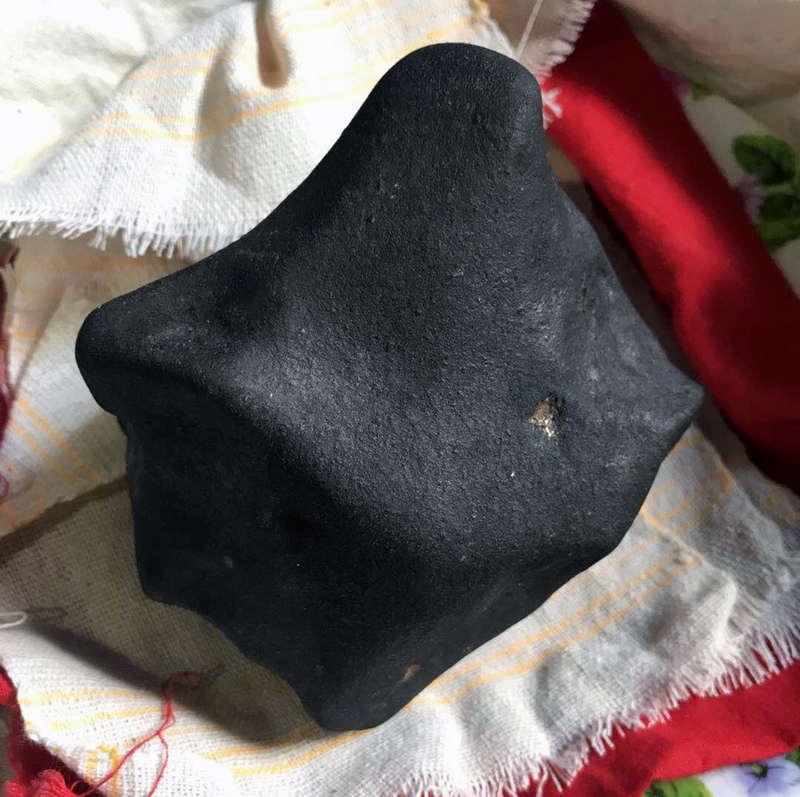 On 12 June it was reported that the meteorite had been classified by Xú Wěibiāo (徐伟彪), a scientist with Purple Mountain Observatory at the Chinese Academy of Sciences, as an L6 ordinary chondrite. 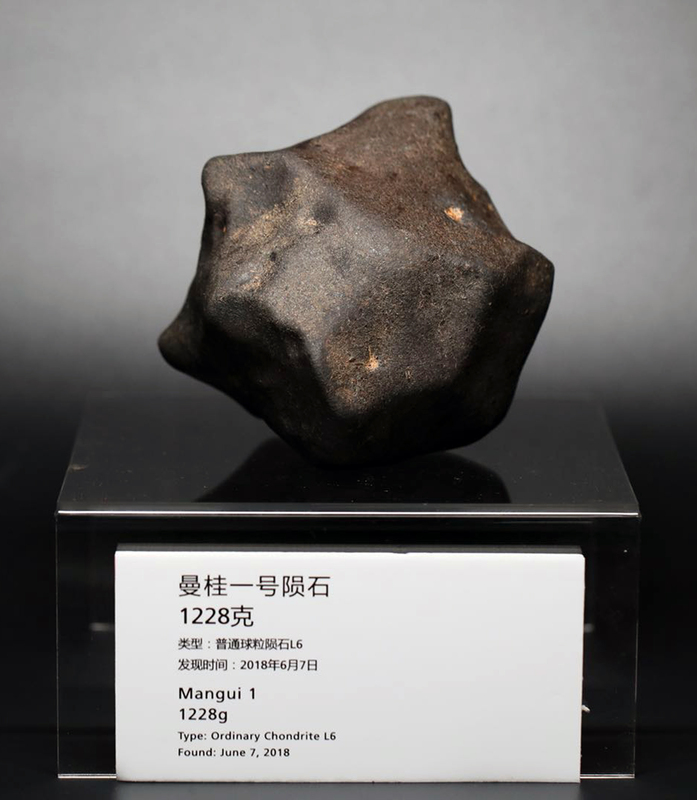 Apparently, on 12 June the name MANGUI (曼桂) was officially applied for at the Meteorite Nomenclature Committee (NomCom). 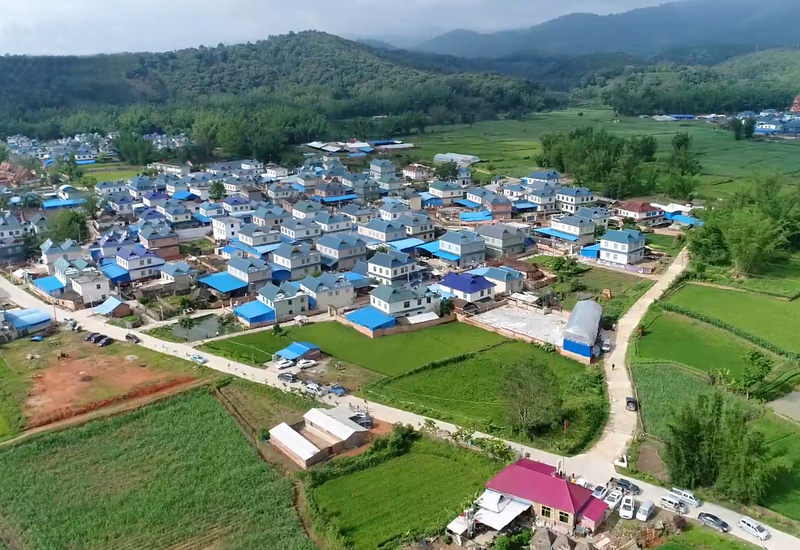 On 9 July it was reported that the Yunnan Provincial Department of Land and Resources had sent a team to the strewn field to conduct a field investigation of the meteorite fall. 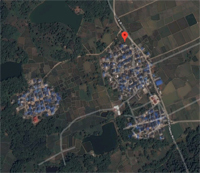 The strewn field is reported to cover an area of more than 10 villages and is about 10 km long and 1-2 kilometers wide covering an area of about 10-20 square kilometers. It is estimated that more than 500 meteorites with a total weight of not more than 50 kilograms had been found by 25 August 2018. On 31 August MANGUI was officially registered in the Meteoritical Bulletin. Ms. Yu Xianghuai (玉香怀) presenting her 1228-gram specimen found in a tea garden near Mangui (曼桂) on 7 June 2018. The 1228-gram specimen found near Mangui (曼桂) on 7 June 2018. Impact hole. Up is north. 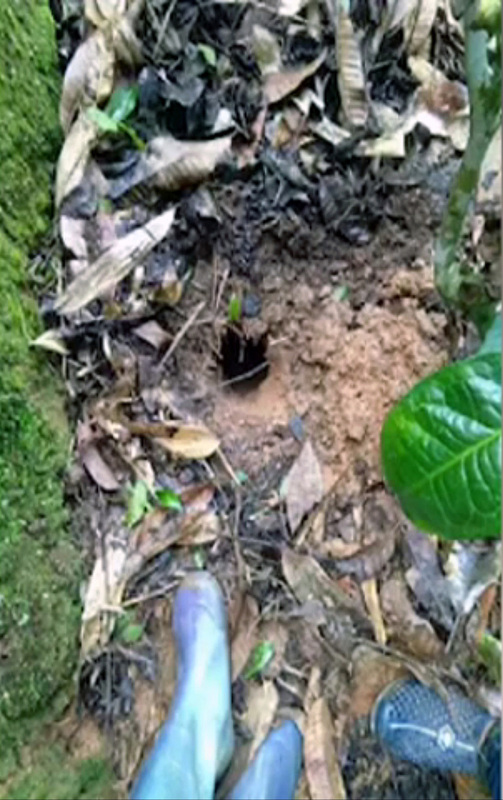 Impact pit of the 1228-gram specimen in tea plantation near Mangui (曼桂). Up is west. Photo: Weibao Hsu, Sen Hu. Up is north. The Mangui 1 impact hole being excarvated by members of the Shanghai Science and Technology Museum, after Zhang Bo (张勃) and Ms. Yu Xianghuai (玉香怀) had decided to donate it. 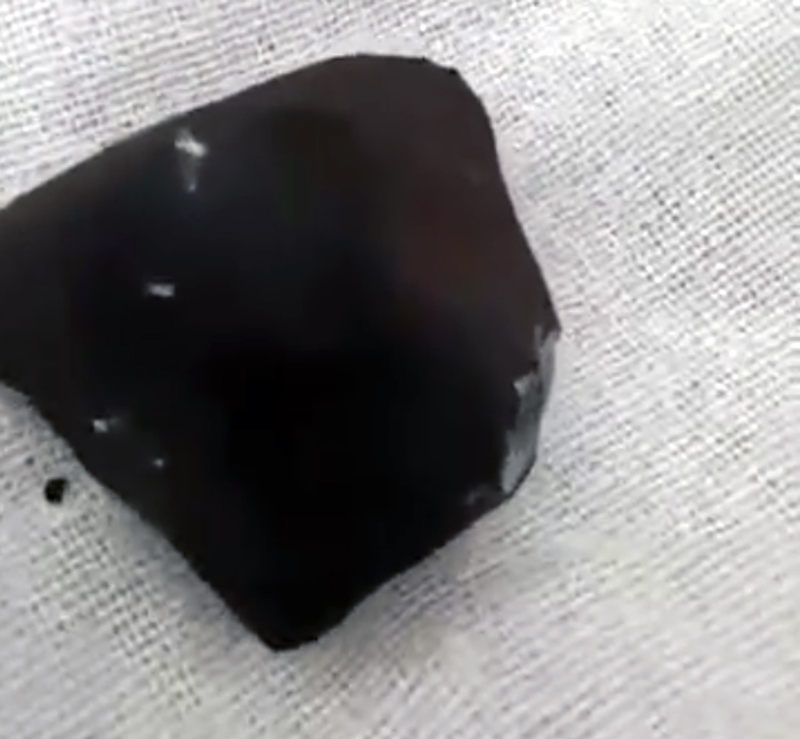 Video of the 84-g-meteorite found by Yán Xiāng (岩香) in the morning of 2 June 2018. The find location of the meteorite on the second floor of the house next to a roof tile. Impact hole in a roof tile of Yán Xiāng’s (岩香) house. Impact hole seen from inside Yán Xiāng’s (岩香) house with the impact hole in the roof. 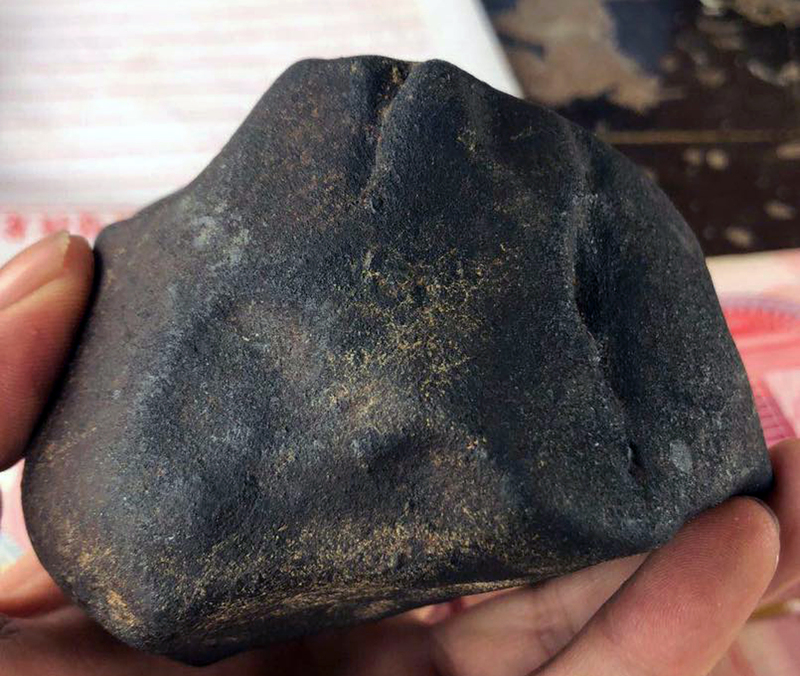 The meteorite which was found by Yán Xiāng (岩香) in Manlun (曼伦), Menghai County (勐海县) in the morning of 2 June 2018. 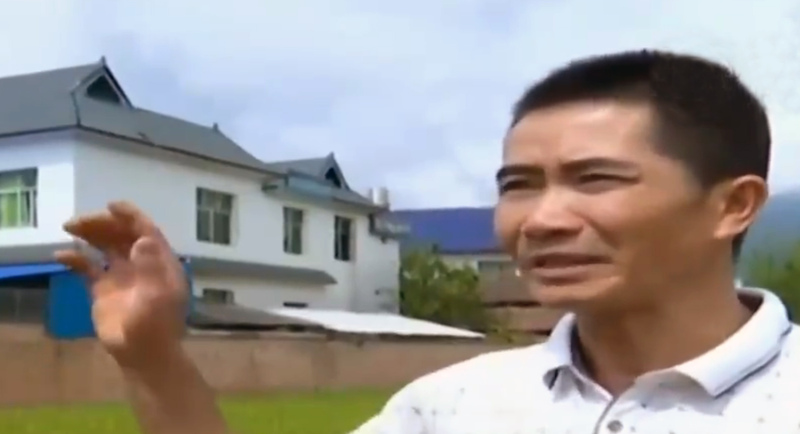 Zhang Baolin being interviewed at Yán Xiāng’s (岩香) house in Manlun (曼伦), Menghai County on 3 June 2018. A larger specimen found by a local woman (estimated size 5.5 x 3.5 cm). Small specimens found by an elderly local woman. 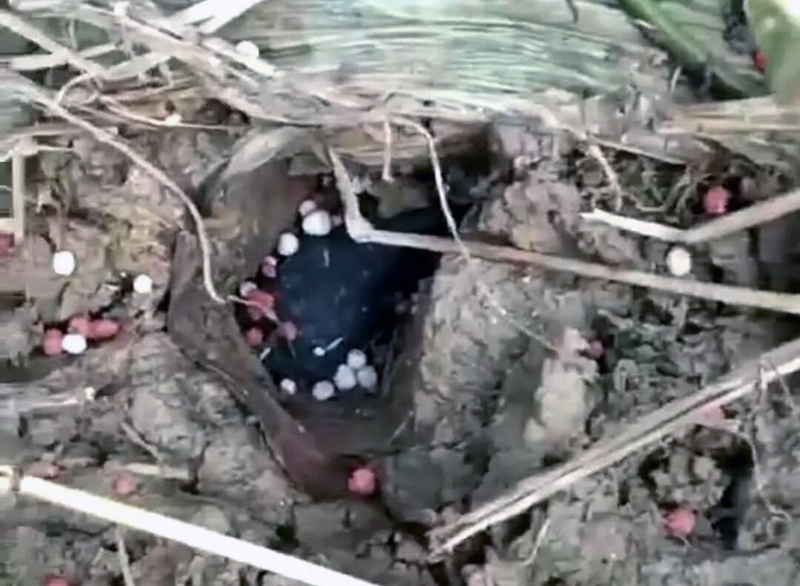 A small meteorite embedded in the soft soil of a sugarcane field. 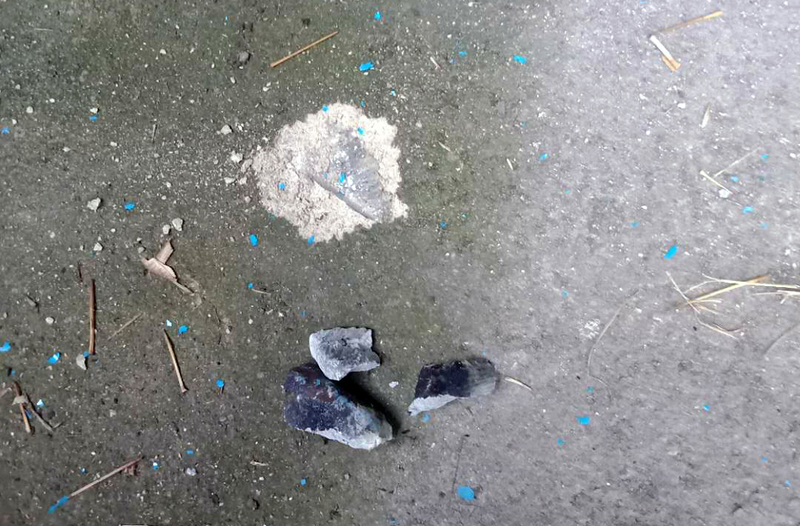 Impact pit on the concrete floor of the cowshed and meteorite fragments. Video of the bolide seen above the city of Jinghong (景洪), moving west. At least two loud detonation sounds were heard. A muffled sound was heard in Jinghong about one to two minutes after the bolide. Mr. Li (李), a villager from Manlun, is reported to have heard a helicopter-like sound. Another video of the bolide recorded with a dashcam. The bolide recorded with a dashcam, while driving on road G214 crossing the New Bridge above the Upper Mekong (Lancang Jiang) river, from east to west, in the city of Jinghong (景洪). The camera location was somewhere here: 22°00’50.6″N, 100°48’23.3″E . Another video showing the bolide. Animated gif of video showing bolide from unknown location.